Stand between the sand dunes and sea oats as you watch the sun melt into the azure blue Gulf of Mexico; then, as darkness fills Bean Point, walk between the dunes in showers of moonlight and feel the kiss of a gentle Gulf breeze. That is your environment at Sundance Cottage. TO SEE MORE OF THIS BEAUTIFUL ENVIRONMENT AND SUNDANCE COTTAGE, VIEW THE AERIAL VIDEO TOUR. The wrap-around porch offers shaded views from the elevated, and completely equipped and supplied, 3-bedroom/2-bath beach house. This turn-key vacation-rental features interior design and furnishing by Egretâs landing which supplies a convenient blend of functional utility and tasteful ambiance. The Mike Miller-designed landscaping graces both front and spacious back yard with only native plants and trees that save the owner substantial time and money to maintain. These tropical plantings surround the generous, salt-water pool, and shaded area under the pergola. The large, enclosed storage and workshop area has more than ample space to store your beach toys, wagons and portable beach chairs and canopies. Beach access is just across quiet North Shore Drive and then a short walk through the dunes and to the beautiful beach at Bean Pointe. This beach has made Anna Maria one of the worldâs most desired beach destinations. 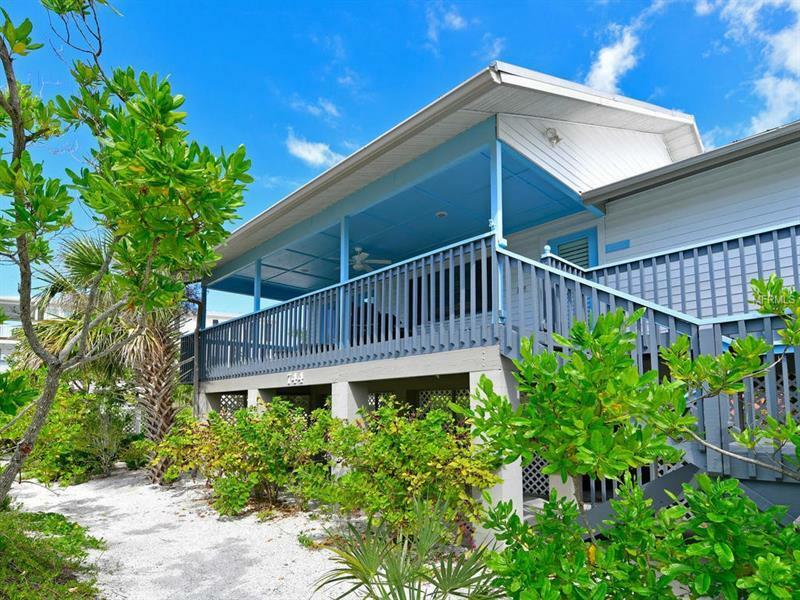 Leave up to four cars in the covered parking under Sundance Cottage and take the trolley to the many shops, galleries and restaurants on Pine Avenue and the rest of Anna Maria Island. Additional Water Information: Public Access to Anna Maria Beach just South of Bean Point. Widest beach on Anna Maria Island. Sand Dunes, sea oats and pristine beach.